Home WEB TV Open Bank & Universal Banking API: Future or Utopia? The recent Barcampbank in Paris was very well attended with an energized crowd mainly from Paris but also a few participants from other countries such as the UK or Germany. Two members of the ‘Open Bank Project’ team came all the way from Berlin to talk us through their game changing concept of universal banking API to drive transparency in financial services and fight corruption. A few weeks ago, the ‘Federation National du Credit Agricole’ (FNCA), France’s largest banking group, ‘rocked’ the worldwide banking industry when they announced the launch of their SDK, a banking API to let third parties build innovative applications utilizing their customer data in a secure way. The day before the Barcampbank, I recorded an excellent interview with FNCA’s deputy CEO in charge of the customer relationship and satisfaction, Michel Goutorbe. 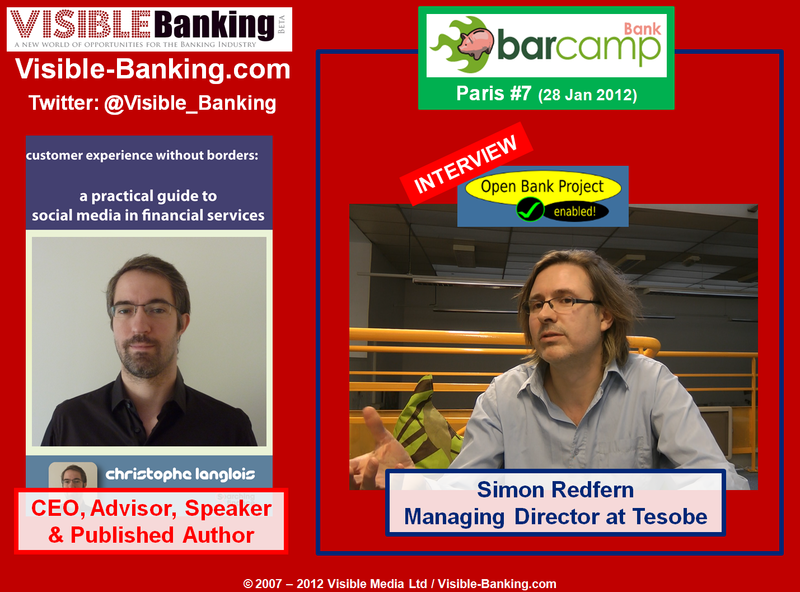 And during the Barcampbank, I recorded another interview on the topic of openess and transparency in banking with Simon Redfern – Managing Director at Tesobe. First, I invite you to get a feel for the concept of transparent financial transactions and how the open bank’s universal banking API could be used by financial institutions, charities and other companies all over the world. Any thoughts? The video of the demo is available on the Visible Banking page on facebook. Now, I invite you to watch my video with Simon, one of the most passionate champions for transparency in financial services. My interview is available on the Visible Banking channel on youtube.